In the Premier Men’s match played at the CIFA Complex on Friday, Nikao Sokattak Football Club disposed of Titikaveka Football Club five goals to one. In the first half of the match, Nikao Sokattak did not hold back as they scored three goals to nil. In the second half Nikao Sokattak and Titikaveka both played an attacking game. Nikao Sokattak scored two more goals to secure the win. Titikaveka had several attempts at goal but were unable to find the back of the net until the 72nd minute of play when Titikaveka found the back of the net for their first and only goal of the match. In the second semi finals of the Premier Men’s match played on Saturday at CIFA Complex in Matavera, Tupapa Maraerenga eliminated 2014 Knock Out Champions Takuvaine in a penalty shoot out of four goals to two. In the first half both teams played their hearts out to try and earn their team a spot in the finals. They both played an attacking game with Tupapa Maraerenga dominating in ball possession. In the second half they both built on their momentum with several attempts at goal that unfortunately did not find the back of the net. The match ended with a one all draw. It was a nail bitting match that ended with a penalty shoot-out and had supporters for both teams on their feet cheering their teams on. Tupapa Maraerenga edged ahead of Takuvaine, winning with four goals to two to see their side progress through to the finals. Nikao Sokattak and Tupapa Maraerenga will meet in the Premier Men’s Finals this Saturday. In the first of the senior women’s semi-finals last Thursday Nikao Sokattak defeated Puakiura two goals to one. The determined Nikao Sokattak scored one goals in the first half. In the second half Puaikura put everything on the line and scored to equalize one all. In the dying minutes of the match Nikao Sokattak’s Poko Manuella secured the win for Nikao Sokattak ending the match with a win for Nikao Sokattak two goals to one. In the second of the semi-finals for the senior women’s division, Tupapa Maraerenga easily eliminated Titikaveka by six goals to one. Tupapa Maraerenga dominated all facets of play and scored three goals in the first half. 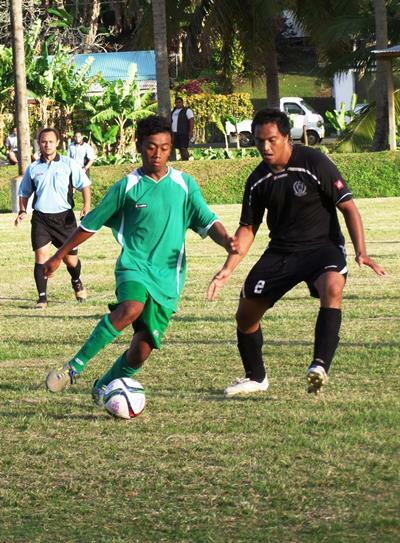 In the second half Tupapa Maraerenga built on its momentum and scored another three goals. In the 66th minute of play Titikaveka scored their first and only goal of the match. The match ended with a full time score of six goals to one in favour of Tupapa Maraerenga. Nikao Sokattak and Tupapa Maraerenga will meet in the Senior Women’s finals on Saturday.